The structure of the [Pb(UMP)-H]+ (UMP = uridine-5′-monophosphate) complex was studied in the gas phase by combining electrospray ionization (ESI), tandem mass spectrometry, and mid-infrared multiple photon dissociation (IRMPD) spectroscopy. The results obtained show that Pb2+ ions interact not only with the deprotonated phosphate group but also with a carbonyl group of the nucleobase moiety by folding of the mononucleotide, resulting in macrochelates that are not likely to be present in solution. 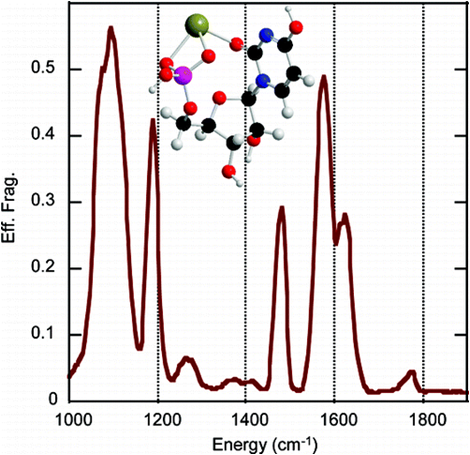 Comparison between the IRMPD and DFT-computed spectra suggests that the ESI-generated complex likely corresponds to a mixture of several structures, and establishes the enolic tautomers as the most abundant species for the [Pb(UMP)-H]+ ion, while the very weak IRMPD signal observed at 1763 cm-1 points to a minor population of oxo forms. Our data also suggest that losing the nucleobase residue under CID conditions does not necessarily mean a lack of interaction between the metal and the nucleobase moiety, as commonly reported in the literature for large oligonucleotides.